A few days after writing a controversial blog article about poser Twitter accounts, I was surprised to find two confirmation emails from malicious sites about my registration with them. The first one was from an adult site while the second email was from a random chat site. Now I'm quite sure I wasn't the one who registered for an account with them. My guess is that the same people or groups of people who were involved in the poser accounts issue were trying to harm me. Anyway, what I did was checked Gmail security log feature in order to see whether my Google email account was hacked. If you have encountered the same issue before or you think your account has been compromised, this is something you might find helpful. 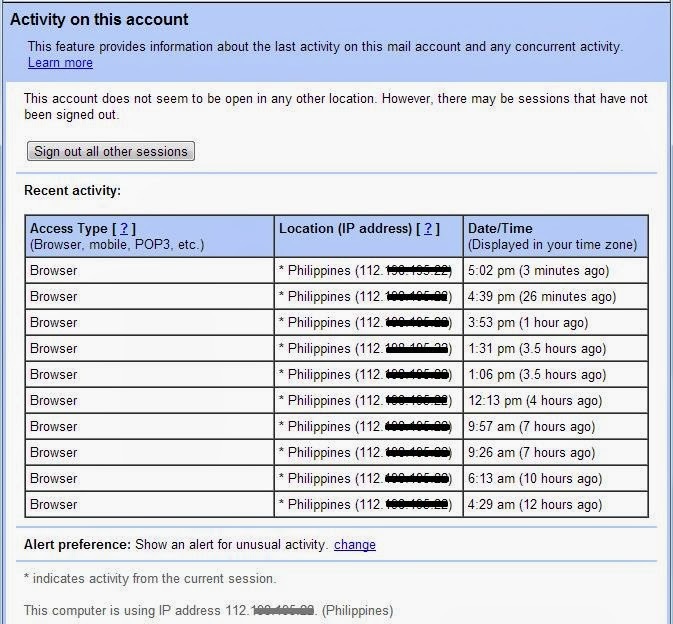 'Last account activity' is an email security feature of Gmail that gives you information about the most recent activity of your account. This includes information on when your account was last accessed using a regular web browser, a POP email client such as Thunderbird and Outlook, a mobile device, third-party applications and many others. 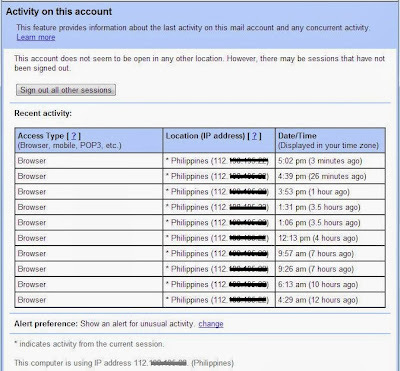 Google will also show the list of IP address, associated location, time and date of when your email account was accessed. A screenshot of how the 'Last account activity' log looks like. When you find an unknown IP address, it may be indicative that your account was accessed by another person. When this happens, it is highly recommended that you change your password ASAP before its too late. If your email was accessed by a third-party application that you did not authorize or no longer use, it is best to disconnect them. To access the 'Last account activity' log, simply click the Details link next to the Last account activity line at the bottom right of any Gmail page. You can also see activity for your entire Google account. Just go to https://security.google.com/ and click Recent activity from the Security menu found on the left sidebar. If you want to make your Google account even more secure I created this guide on how to secure Gmail account from hackers on my personal blog. As a blogger, protecting our email accounts is very important. Most of us, particularly those who use the Blogger platform use Gmail account in order to login. Can you imagine losing access to your blog? The horror! 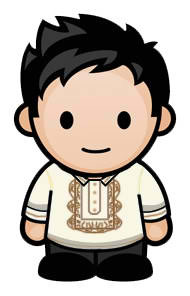 This is the reason why I activated 2-step verification. You can learn more about it on my 'how to' post above. Please share your thoughts on this issue. If you have additional security tips, do share in the comments box below.